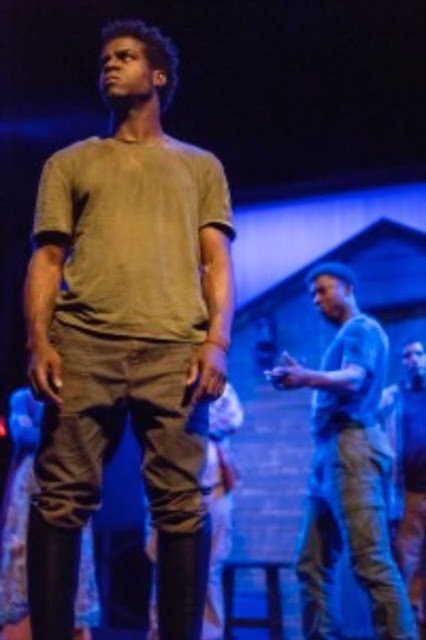 Carol's Theatre Reviews ~ It's Fun To Go Out: Suzan-Lori Parks’ “Father Comes Home From The Wars” Hits On Core of Black-White Divide. 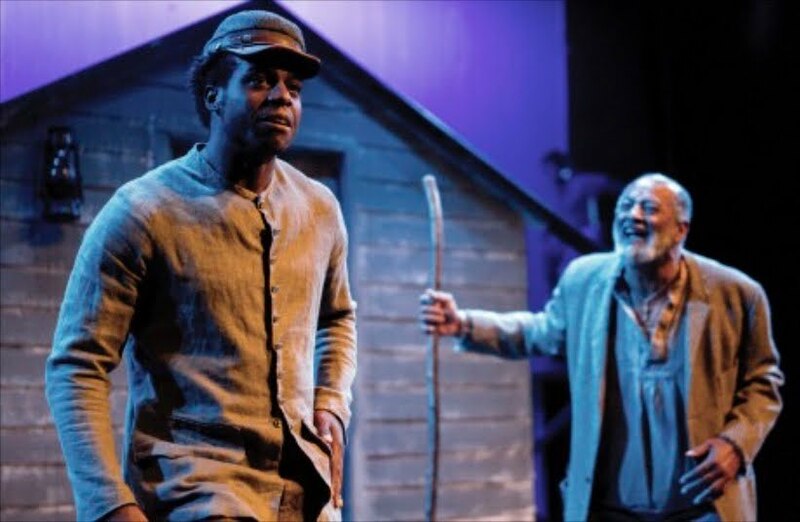 Suzan-Lori Parks’ “Father Comes Home From The Wars” Hits On Core of Black-White Divide. Intrepid Theatre Company is currently mounting a beautifully nuanced and compelling San Diego premiere and final main-stage production of “Father Comes Home From The Wars” by Suzan-Lori Parks through Nov.5th at the Horton Grand Theatre. It’s a three parts or chapters or acts; ode to the lengthy anguished and long ago battles that had their beginnings when blacks were brought to this country and sold as slaves. Today they are literally and painstakingly still fighting to free themselves of the shackles that bound them to their masters then and now to a society that strives to keep them in their place. Neither Parks (“Top Dog/Under Dog”) nor the movers and shakers of Intrepid Theatre Company are ones to back away from a controversial topic, and while this subject is still a hot potato as negative symbols of Southern Confederate idealism are being removed from universities, common squares and major highways in certain parts of our country, the conversation Parks offers begins in 1862. What would his going along with the Colonel look like to his friends? According to the Leader (Leonard Patton), “Working as the boss-masters servant”. Another, “That’s what Hero does here, so that’s what he’ll do when he goes to the war. His job aint gonna change just cause he gets to wear a fancy uniform.” And so they bet. Will he go or will he stay? His best friend and soon to be adversary Homer (Cortez L. Johnson, "Ballad of Emmitt Till"), whose foot was severed by Hero at an earlier time when the slave tried to escape and Hero caught him, weaves itself trough the stories as their friendship, or not becomes an issue later on. Hero’s fellow slaves along with the Oldest Man (a wise and convincing Antonio TJ Johnson), his surrogate father are taking up sides while his old dog Odyssey (a charming dog like in a sheepskin collar and pilots hat, Durwood Murray) has taken off and that’s not a good sign. But to trust a white man who has never kept a promise before, or to break a promise to his live in Penny (Tamara McMillian) that he will not go and to leave without his faithful dog are but some of the questions asked in Book I “The Measure of A Man”. Parks sets her play in Early Spring, 1862, Far West Texas. Hero’s journey/odyssey in this the first of three (and according to the playwright she has a few more chapters up her sleeve) episodes that focuses in on the what if’s of Hero’s choices, none of which look promising. Alone in a wooded area with Hero and a wounded captured Union Captain, Smith (Sean Yael Cox) the Colonel, strumming a banjo, looking like a joke with a huge white feather in his Confederate hat and drinking like a fish, is on again off again worried about the cannon sounds coming from a distance (T.J. Fuccella) and how close they are. He eventually leaves the two to their own difficult discussions and decisions as to what their next life’s chapters will bring. This episode surprises and gets to the heart of the -what and why the black community thinks and acts as they did and do. It is also most humbling and intriguing as Parks zero’s in on the discussion of what makes a man free and what is his worth as a free man as opposed to his worth as a slave. In Part Three, “The Union of My Confederate Parts” finds Hero in 1863 back at his Far West Texas run down plantation, where everything has changed including his relationship not only with Penny who has been living with Homer since Hero left but also within himself. Before we see Hero coming home his dog Odyssey returns and announces Hero is on his way and relates to the group outside the shack, his whereabouts. The productions under the deft and fluid direction of co-founder Christie Yael-Cox with co-direction by Antonio TJ Johnson, is perhaps one of the most profound, oft times funny and quite disturbing play I witnessed in some time. Parts One and Two play straight through without an intermission and Part Three follows intermission. The show lasts about three hours. Music plays a major role in Parks’ odyssey with musician Jim Moody playing the guitar and harmonica and generously voiced Leonard Patton (MIXTAPE) singing accompanying blues. Set on an almost bare stage (Sean Yael Cox) with a ramp in the background for exits and entrances, with excellent lighting by Karin Filijian highlighting the comings and goings. 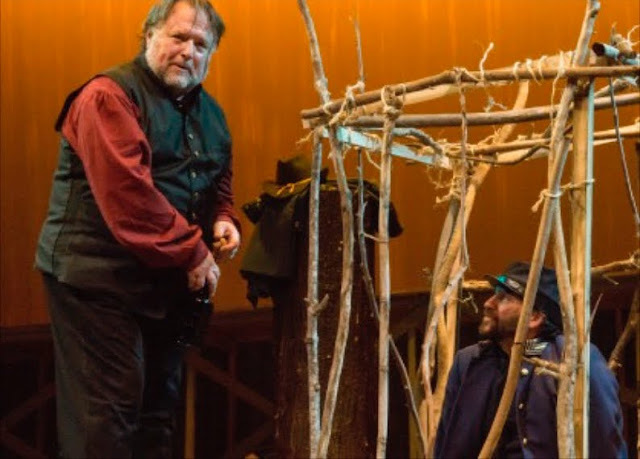 Costumes by Jeanne Reith are eclectic and fight directors George Ye and Rhys Green make the combat between players look so easy. With universally outstanding acting “Father Comes Home From The Wars” is just the tip of the iceberg as Parks is hoping to add some spice to the conversation. That said the dialogue she opens is still raw in the scheme of things nearly fifty years after the Civil Rights Act of 1964 was signed and one hundred and fifty- four years after the Emancipation Proclamation, ninety-three years after the statue of Lee was erected in Charlottesville, S.C. While opposition to football players kneeling during the National Anthem will dominate the conversation and continue to stoke the the cycle of violence from the voice in the White House the systematic violence and supression continues. 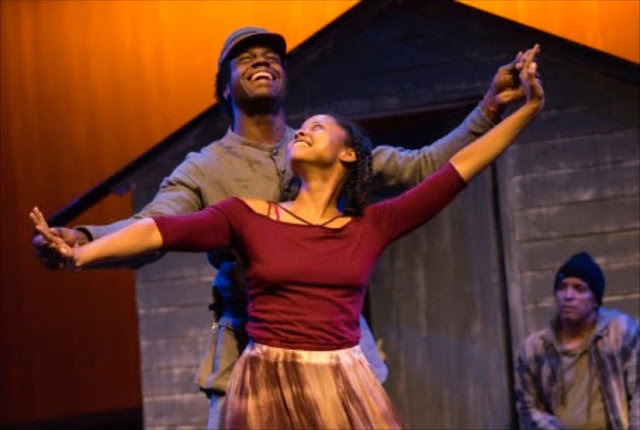 “Father Comes Home From The Wars” is not to be missed if you are truly interested in seeing prejudice through another set of eyes. Where: 444 Fourth Ave, Downtown SD.